Today was a catch up day. Tradtionally I hate them, but more often they're necessary. I was able to watch the midseason finale of Once. OMG! How am I supposed to wait a month for new episodes? Guess that means we focus on Hook's costume. Meow. Also I now have a sewing apprentice so to speak. Lover wishes to learn sewing and I wish to have help fitting garments. Two birds, one stone. Though it could lead to intersting times. At least I get lucky that he likes to dress up. Plus there's talk of a weapons collection. Ooo swords. Some day I'd love that to extend into actual reenacting. Perhaps it's just because of the tent. 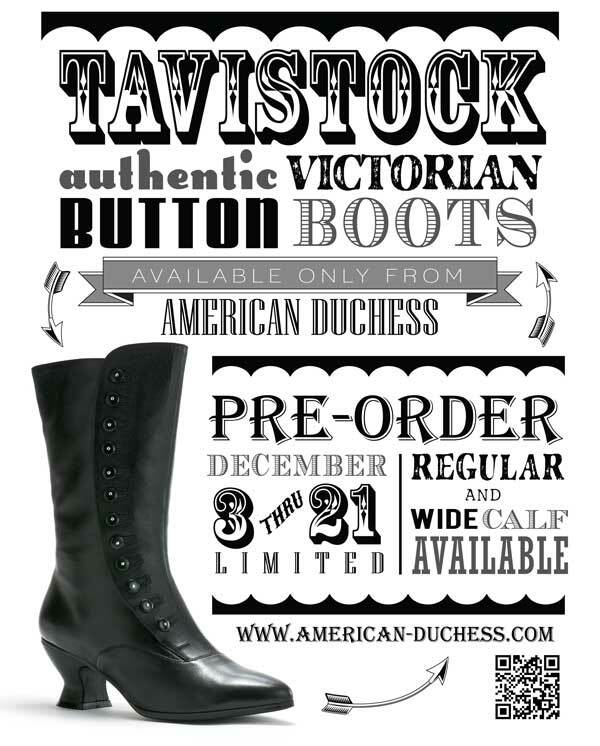 Also, it must be mentioned, American Duchess has a pre-order on a new shoe design! I'm in love with her red colonial shoes. I have yet to talk myself into spending the money. I can be very thrifty. Still one must mention the new shoes! Victorian boots, not my favorite time persay, but one of my fantasy characters exist there. One day, I'll actually get to be more than a poor grad student. Then I could have pretty red shoes for Abigail and button boots for Holly and Anna. Plus Marian could wear silk. And yes, That probably made little sense to many but I've been in the Southern Comfort and my voice is practically gone. Plus it's late.Dreamland awaits. PS: All Hail the American Duchess and her beautiful Shoes! !